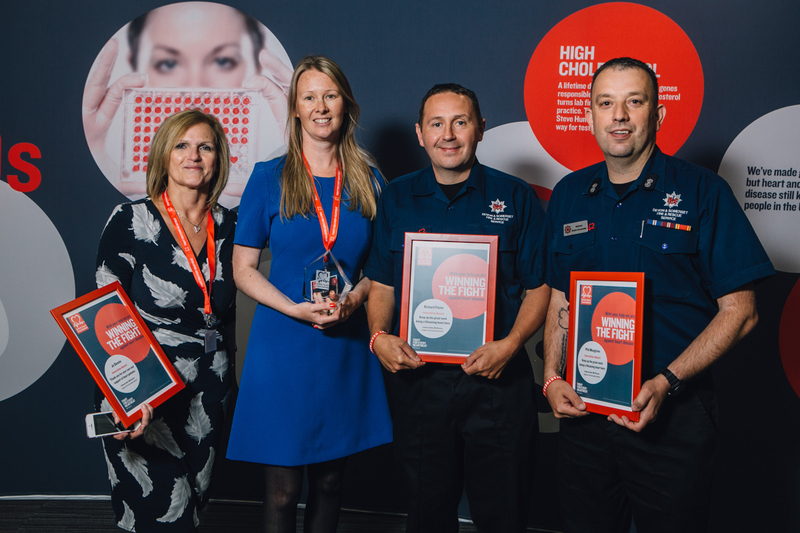 SCAD patients Bronnach Pemberton and Rebecca Breslin have both won British Heart Foundation Heart Heroes awards. 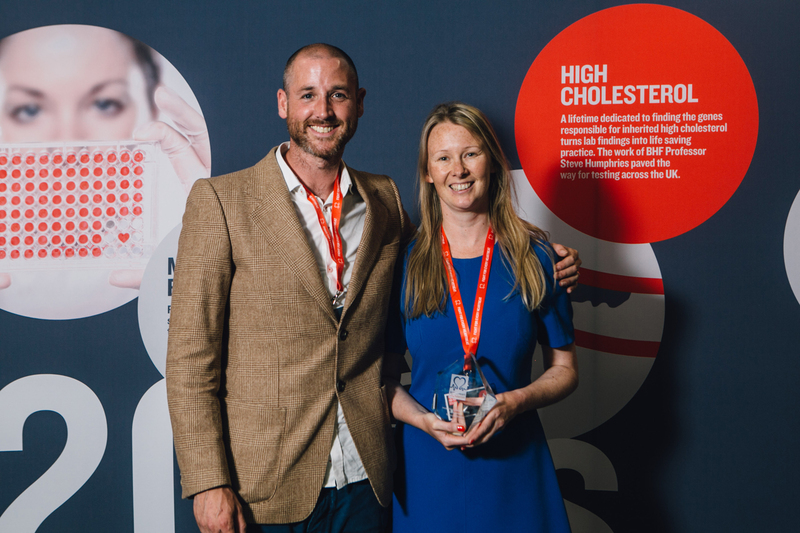 The annual Heart Hero Awards recognise and celebrate the exceptional contribution that BHF supporters, fundraisers, volunteers and partners make to the charity’s mission to “fight for every heartbeat”. Bronnach won the Influencing award in the North of England. Since having her SCAD event after the birth of her third child, she has been pro-active in raising awareness of both spontaneous coronary artery dissection (SCAD) and heart failure. Watch her story here. She said: “I am very honoured to have been nominated never mind actually winning this award. It is bittersweet however. As much as I am happy to have won, I would have loved to have never been ill in the first place. It was very humbling to have been amongst other nominees at the ceremony. “The conference was an amazing experience, it highlighted how the money we raise is spent and how it benefits people like myself and the other SCAD survivors. Beat SCAD Chair and co-founder, Rebecca Breslin, won the Innovation award in the Midlands. 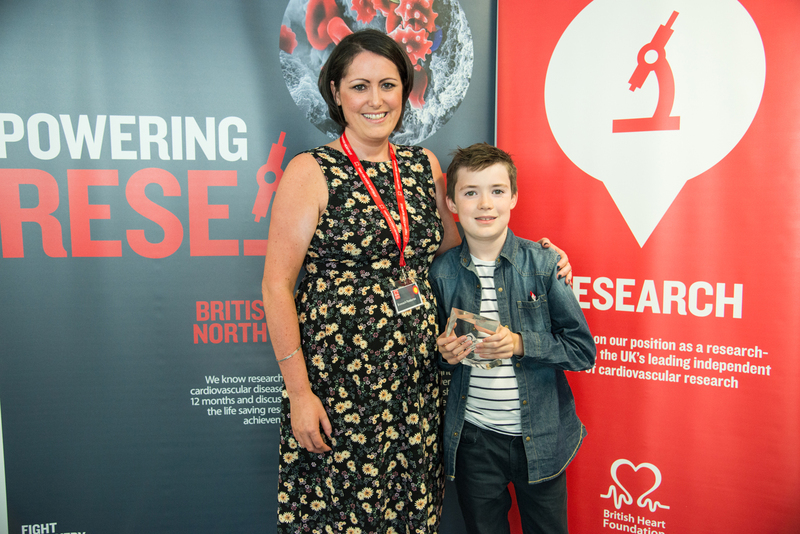 The BHF said she “single-handedly pushed for pioneering BHF-funded research into the condition, sought out other SCAD patients to form a support network and made sure they had a voice in the research. As if that wasn’t enough, she was a leading light in setting up the new awareness-raising charity Beat SCAD”. Watch the BHF video about the research here. She said: “I had a fantastic day at the BHF Midlands Supporter Conference. There were lots of interesting and enthusiastic people representing some of the BHF’s important heart research. The Heart Hero Awards in the afternoon were emotional and inspirational – so many amazing people involved in fundraising and other activities for the BHF, including my fellow category finalists (pictured below) and some awesome youngsters. “I am immensely proud to have won the Innovation category and it is truly a tribute to our global SCAD community who have rallied together with the shared mission to find answers about SCAD. Congratulations to both Bronnach and Rebecca for their achievements in winning these awards. Paul Rivlin, a former student of the University of Leicester, is taking part in a five-week Endurance Rally Association Challenge, driving from Peking to Paris to raise money for the SCAD research project at the university. 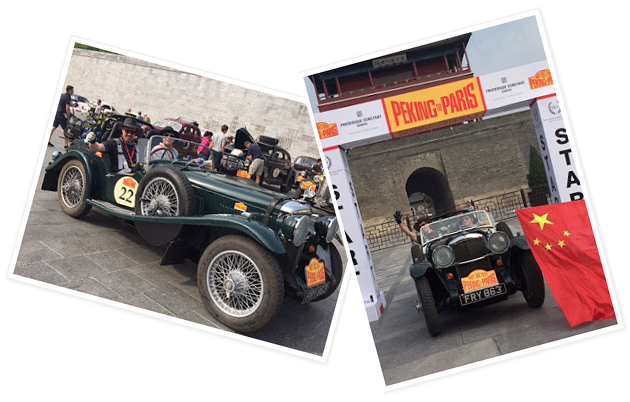 Paul and his team-mate Richard, will be driving the 13,500km (8,500 miles) from Beijing to Paris, through 13 countries, in their vintage 1935 Alvis Silver Eagle car, Emerald. They will travel through the Gobi Desert and across Siberia to raise money. Paul and Richard started the trip on 12 June at the Great Wall outside Beijing and will finish 36 days later with a drive into Paris to cross the finish line in Place Vendome on 17 July. You can follow Paul’s journey with Emerald via his online blog. There are some great photos of the car, the story of a breakdown and how the car got back on the road, as well as a whistle-stop tour of tourist attractions along the way – it’s a great read! The SCAD UK and Europe research portal is an initiative of the NIHR Leicester Cardiovascular Biomedical Research Unit and is part of an international collaboration of patients, doctors and scientists to undertake research into this condition. The research and clinical content is reviewed by a team led by Dr David Adlam, a senior lecturer in the Leicester University Department of Cardiovascular Sciences. More than 400 SCAD patients have signed up to take part in the the research project and nearly 100 patients have so far been seen by the research team. We need to find out what causes SCAD, how it can be treated, as well as if and how it can be predicted or prevented. To do this the research project needs more funding, so Beat SCAD is very excited about Paul’s endeavours to raise much-needed funds for this vital research into SCAD. “It’s great to hear about Paul Rivlin’s Endurance Rally Association Challenge in support of the SCAD Research at Leicester,” said Beat SCAD Chair Rebecca Breslin. “Driving a 1935 Alvis Silver Eagle from Peking to Paris sounds very glamorous, sort of romantic… but when I think back to when my husband owned a Triumph Spitfire, I remember how we ‘looked the part’ in the old classic but the maintenance was demanding and we missed the advances of a modern car – especially on a long journey! Click here to donate to this fantastic fundraising via Paul’s Just Giving page.